New Montana Council items have arrived in time for Christmas! Council walking stick medallions, hat pins and a new belt buckle that looks great when dressing up or down. These items are available in all Montana Council stores and online. Don’t forget, our stores have more to offer than just uniform parts and patches. We have a wide variety of council merchandise and BSA items. Think of our stores when shopping for that perfect Christmas gift or stocking stuffers. New in the Missoula Council Store only, paracord by the yard and accessories! Available in two styles (550 and Type 1 paracord) and a variety of fantastic colors. The Kiddos will love all the fun choices when making paracord bracelets and other crafts. Come and check it out. 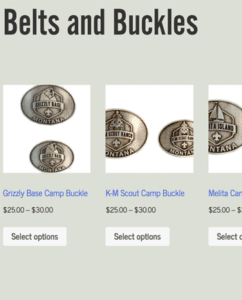 For information on contact numbers and Scout Store locations, visit our Contact Us web page here, and always remember we are available at your convenience 24-hours-a-day, 7-days-a-week online!